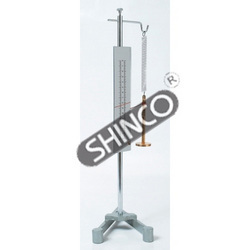 With rich industry experience and knowledge, we are providing an excellent quality range of Hooke's Law Apparatus. Consisting of a 12 cm. aluminimum scale, spring, slotted weight hanger (without slotted weights) complete on metallic stand. The apparatus consists of a 15cm adjustable mirror scale supported by wooden back and mounted on a sturdy round base support of 30cm height, an adjustable hook and a spring with a weight hanger are attached to the top of the rod. A pointer is fastened to the weight hanger, supplied with 5 pieces of 20g slotted weights. For demonstrating Hooke's law and for studying simple harmonic motion of vibrating weight suspended from spring and potential energy. 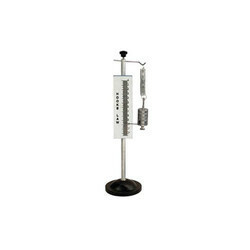 It consists of a heavy base with an adjustable mirror millimeter scale, a spiral spring with indicator and weight hanger. - A spring with pointer and provision to hang set of slotted weights. This complete apparatus has a 15cm. adjustable mirror scale, to prevent parallax error, and is graduated in millimeters and mounted on sturdy 30cm. support rod. A hook supporting a coiled spring with a mass hanger and indicator is attached to the rod. Supplied with slotted weight of 250gm. capacity.